Vienna-born Carl Millöcker would be pretty much unknown but for his operetta Der Bettelstudent. In that sense, for the time being, he finds himself in the company of other Strauss contemporaries whose works have their place in Marco Polo's Contemporaries of the Strauss Family series and Tonstudio's Spirit of Vienna volumes. CPO have here helped him take one further step forward as they have done for Eilenberg, Gung'l and Bilse (777 341-2), all conducted by Christian Simonis although not necessarily with this orchestra. Ivanovici is also of this school and his music can be heard on an Electrecord disc. Why have there not been any Robert Stolz collections like this? 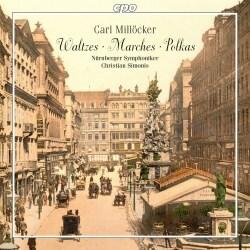 Millöcker has scored prominence with complete recordings of three of his operettas. I have already mentioned Bettelstudent (review review review) but we should not forget Gasparone (review review) and Dubarry. The Nürnberger Symphoniker and Christian Simonis, openly and clearly recorded, are practised hands when it comes to the nineteenth century courtly ballroom dance genre. It is not just that they are technically honed but they also demonstrate their ability to keep their music-making supple and airborne. This is sumptuous and 'floaty' playing and it makes for delightful listening. Control and romance are held in equipoise. The Overture with its Dvořák, Offenbach, Smetana and Rossini pre- and post- echoes is a rattling discovery and would surely have made its way in the world if only Millöcker had given it a proper name. Its central waltz passage presents impeccably beguiling credentials. Cyprienne - one of many a Polka schnell on this disc - races along, flounces flying, with confidence at high port and a polished sheen. In the Probekuss Waltz serene violins proclaim the airy defeat of gravity. We cannot escape Bettelstudent which here is represented by an extended and magically sedate concert overture. A particular treasure is the Pizzicato-Walzer, a grand companion to Josef Strauss's famous Polka. Here it is given with fairy-feathered attention to tempi and zephyr-delicate dynamics. It's a real charmer and would make a revivifying choice for the Viennese New Year. We end with another whirlingly seductive brief Polka schnell, Quecksilber (Mercury). The only mystery here is that the booklet lists 14 tracks but the insert and the disc sport only thirteen. Missing is Valerie - polka mazurka (1882). I am not sure what happened there. If you are partial to the orchestral dance music of Vienna's golden decades before the Great War then you need look no further. Certainly, Norbert Rubey's supporting liner-notes (German and English) are no reason to turn away; quite the contrary.